Episode 6​1 - ​​Maria Filippone​,​ D.O. Dan Sterenchuk and Tommy Estlund are honored to have as our guest, ​Maria Filippone​,​ D.O. 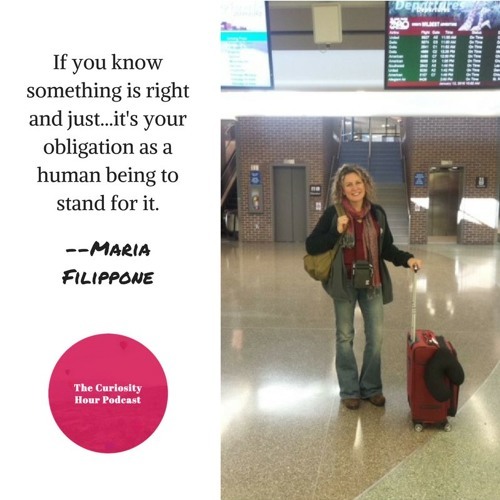 Maria is a physician, co-founder of Des Moines Young Artists' Theater and co-owner of Noce, Des Moines’ premiere jazz club. She is a mother to three girls, and has been pursuing a life long dream of learning Arabic. Creating a live jazz club is the latest project Maria and her husband, Bob, have undertaken. Maria loves to garden, write, dance and travel. Her favorite place to travel is Palestine-Israel. Maria volunteers in Gaza as often as possible, offering medical education and mental health care to the two million people living under siege. She is currently training to become a yoga teacher. Note: guests create their own bio description for each episode. The Curiosity Hour Podcast is hosted and produced by Dan Sterenchuk and Tommy Estlund. Please visit our website for more information: thecuriosityhourpodcast.com Please visit this page for information where you can listen to our podcast: thecuriosityhourpodcast.com/listen/ If you would like to share your story or have a suggested guest, please complete the "Contact us" form: thecuriosityhourpodcast.com/contact-us/ Disclaimers: The Curiosity Hour Podcast may contain content not suitable for all audiences. Listener discretion advised. The views and opinions expressed by the guests on this podcast are solely those of the guest(s). These views and opinions do not necessarily represent those of The Curiosity Hour Podcast. This podcast may contain explicit language.